drg. Aulia Yudha Prawira, Sp.Perio "Are You Sure with Your Perio Treatment"
drg. Alexius Eron Tondas, Sp.Pros "Smile Designing with Resin Komposit"
DR. Drg. 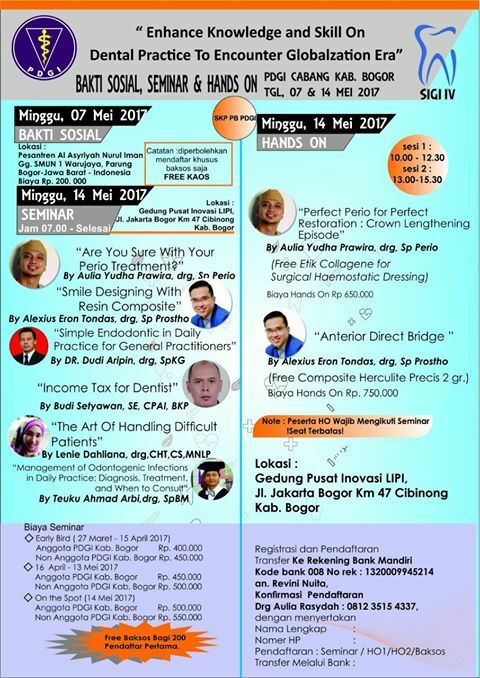 Dudi Aripin, Sp.KG "Simple Endodontic in Daily Practice for General Practitioners"
Budi Setiyawan, SE, CPAi, BKP "Income Tax for Dentist"
drg. Lenie Dahliana, CHt. CS. MNLP "The Art of Handling Difficult Patients"
drg. 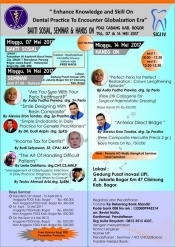 Teuku Ahmad Arbi, Sp.BM "Management of Odontogenic Infections in Daily Practice : diagnosis, treatment and when consult"
"Perfect Perio for Perfect Restoration : Crown Lenghtening Episode"